Second Livestock, chicken virtual reality: Iowa State professor Austin Stewart's technology commentary. What do you think is going on in that bird brain? Image courtesy of Austin Stewart. If chickens could explore fields, barnyards, and forests through virtual reality, they would only need little multi-directional treadmill to make them think they were free range. And maybe manufacturers could keep them in little enclosures, pipe in sunlight, and then slaughter them and sell them for a lot of money. Sound crazy? It’s not exactly a joke, but nor is it a real project (yet)—it’s a social experiment. Austin Stewart, an assistant professor at Iowa State University, created the Second Livestock website and video (below) as a way of starting a conversation about how people use technology to solve problems. 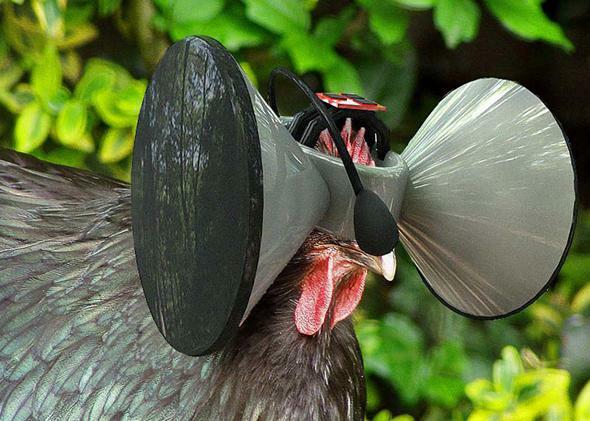 Of course chickens wearing virtual reality headsets seems a little out there, but the website and video are convincing enough to give people pause. Stewart has been presenting the concept in different parts of Iowa and says that he wouldn’t be opposed to working with someone on a related invention if he gets any offers. 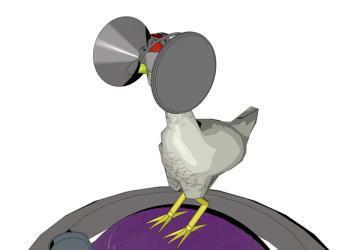 But can bird brains even process virtual reality the same way humans do? Don’t look for Second Livestock’s series A funding round any time soon.